The Valley of Fire, some 35,300 acres, is Nevada’s largest state park, and derives its name from spectacular reddish marbled sandstone rock formations formed 150 million years ago by great shifting sand dunes during the age of dinosaurs. The Valley of Fire is a former home of the Basket Maker people and later the Anasazi Pueblo farmers from the nearby fertile Moapa Valley (circa 300 BC to 1150 AD). It is also the home of some very fine examples of Native American petroglyph rock art and an abundant collection of sandstone arches. A popular desert location for hiking, archeology, geologic study, wedding parties, high desert prospecting and for family adventure. The visitor center is outstanding: offering diverse information for the desert naturalist and the family camper. You will find some fine hand-crafted mementoes as well. It is just after six A.M. on a November Saturday morning in Las Vegas, the sun is rising like a fiery inferno outside my east-facing hotel window. Brilliant hues of cadmium yellow light appear at the sun’s vortex graduating outward through pale gold, Indian yellow, Naples yellow; oranges, reds to a plethora of violets that fill the early morning horizon. Verbally describing the beauty of a sunrise or a sunset is a challenge. The natural spectacle bores its way into your mind’s eye leaving a lasting impression forever—or until at least until the next better one comes along. Burnt in my memory today is a recent sunset, enjoyed in the Nevada desert that was wonderous at the Valley of Fire State Park located in southern Nevada just an amazing 22 minutes northeast of the famous Las Vegas Strip. For our party it seemed as if nothing could top this day in the desert, as we returned via NV route 167 to our Las Vegas hotel late in the afternoon. That is until the sun set. As we rolled along homeward-bound on the winding desert highway, the sun was sinking into the barren western foothills far ahead. Dark clouds formed, appearing as a foggy mist, giving the lower wispy edge a sense of distant rain about to fall. The colors of the sinking sun accented the low misty edges creating a lustrous contrast with the deepening night sky. This sky truly appeared as if huge roaring fires were just over the next rise, the sky was ablaze. Over each new rise were renewed sunset views, rounding each bend, climbing over each hillock revealed a pinker blue, a more violet yellow, more orange vermillion sy. Each turn revealed a new spectacle. We stopped and stared, and to photograph the scene several times along the way. Chasing the sunset, traveling some ten miles due west in the changing evening light, soon the last desert rise revealed an expansive view of the city of Las Vegas. It’s expansive valley below decorated with twinkling city and Strip lights, a uniform crosshatch pattern ending in darkness at the silhouetted distant foothills. This is as spectacular as sunsets get. 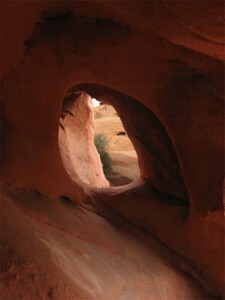 There is an underlying magic at the Valley of Fire. 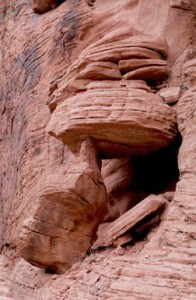 The rock formations are exotic. The unique textures created by moving sand dunes millions of years ago seem to indicate flowing water in their graceful lines. The rock shapes are very unique to the eye as if from a distant planet. One absolutely must partake of this phenomena, it captures the imagination and marks the mind with an unforgettable beauty. One would not expect to see the abundant plant and animal life here in the high Nevada desert. But Mother Nature’s garden is laden with carefully placed, thirsty plants, thriving as readily in the sand as in the crevasses of the swirling rocks. Plants like creosote (kree-a-sote), and ocotillo (oco-tea-yo), cholla (hoy-ah) and complex teddy bear cactus, barrel cactus; then wildflowers in clusters of tiny yellow and spindly white-dot thrive in the arid landscape. It is a surprisingly unexpected panorama of vegetation in a climate where summer temperatures can exceed 120 degrees. Tracks of small wild animals and birds can be seen with tails drawing long curved arced tail trails between paw prints in the desert sands. Occasionally small animal and bird tracks intersect in a flourish of paw, claw and wing imprints, then all imprints or remnants of a trail disappear suddenly as the bird takes flight and returns to the nest with its prey. With luck, the tiny, animal is quick enough to escape the grasping sharp talons and beak. Scurrying paw prints are often seen leading to a nearby safe haven under a log or in dense brush, even down a small, safe ground hole. Day Two—Arising before the sun this morning at 5:30 a.m., I drove into the desert on Interstate 15. 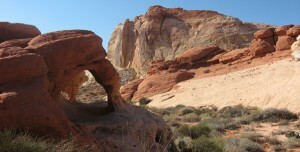 The exit ramp to The Valley of Fire is just twenty-two minutes northeast of Las Vegas, state route 169. Leaving the Interstate and civilization in the dust, I drove deep into the high desert, eleven miles to the park entrance. No one was about at that early hour while I enjoyed the long rolling straight-aways of the two-lane desert road leaving a rooster-tail of desert dust behind as every spec of transient road dust took flight in my path. The quiet morning air seemed surprised at my passing as it rushed past my window roaring like an earth-orbiter entering the atmosphere. A jackrabbit bounded ahead in giant gliding leaps over low lying plants and bushes. His top speed allows him to easily outrun coyotes and other predators. Driving into the valley the road invites you onward. highlights and opposing dark shadows. Barely a cloud appeared in the cerulean blue sky providing a wonderful contrast between the sky and the colorful landscape of cadmium orange to vermilion fiery sandstone. I stopped periodically for a photograph observing the quiet of the desert, whiffing the smells of creosote and wild flowers. A coyote stood near me at one point maybe 20 yards off. His stance was confident, he was quite thin but his fur was very healthy looking. His eyes were bright and piercing, clearly he was beautifully adapted to the lean desert climate. Turning left onto the Park Visitor Center road, passing by the Center entrance I continued on toward the petroglyphs at Mouse’s Tank and the panoramic open view of Rainbow Vista. I planned to hike into the desert at Rainbow Vista first, before walking the petroglyph trail. It was about 9:30 in the morning when I arrived at the roadside viewing area. Gathering my camera bag, tripod and essential water I marched out into the rolling rock landscape, shivering as it was still fairly cool for a November desert morning. I already knew though, that my sweatshirt would soon be more warmth than was needed for this hike. Walking this arid, bumpy landscape is tough going and I was already breathing hard and wiping the beads of sweat from my brow. The perception of most people is that the desert is just sand, little or no water and very little vegetation except perhaps at an oasis or two, if that. The high desert is not like that at all, there is a rich and diverse plant and animal population here despite the rough climatic temperature extremes and sparse rainfall. One can easily find examples of beavertail cactus, a member of the pricklypear family; silver cholla cactus, armed with very sharp spines hooked on the ends which, as a means of propagating, easily attaching themselves to passing animals or unwary humans; and whipple yucca, like the cacti this plant has a shallow root system designed to capture surface water that it stores in its fleshy leaves; and desert chicory, often called “desert dandelion” blooms in bright yellow February through July. At the Valley of Fire the color of sandstone changes and evolves in long flowing lines, as if the desert is a marble-cake. Might be an Anasazi window to the other side. Transformed long ago, the landscape follows the path of erosion: trenches become small gorges that become arroyos that become valleys. 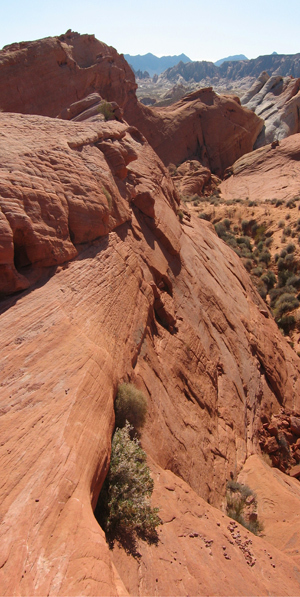 Rocks of all sizes are composed of multi-colored sandstone layers some you can trip over, some you must crawl over and some require rappelling skills. At one point in my hike, I came out on a ledge that was my path’s abrupt end. To proceed in my chosen direction I needed to climb down. The drop wasn’t that great but the hitch was that I couldn’t see over the rounded sandstone overhang that dropped away to the next lower canyon shelf (one never know what one might drop on). Blocked from view, and minus a periscope, even a mirror and a long reach would have helped, I guessed there to be a drop something between 5 feet and 8 feet, I decided to use the amateur’s hang-over technique because clearly what lie ahead was the only short route to the lower level of the canyon i was seeking. Digging my toes into the rock, I reached my head out over the edge push-up style. It looked clear enough. I attached my tripod to my camera bag strap, with a small cord. I hooked on a 36 inch bungee cord that I dangled over the rounded ledge toward my destination. This was intended to enable me to reach up and pull my equipment toward me if the drop was greater than my height. I just laid down parallel to the ledge and rolled my feet off. ZOOP! Down I went. It was about 5-6 feet to the next ledge, and from there I easily could pull my equipment down to me. Turning about I studied the landscape for a path deeper into the canyon while I studied the wonderful colors of the rock formations. A high mountainous looking formation ahead was reminiscent of Yosemite’s Half Dome, much smaller, perhaps only 80 or 100 feet high. The front was sheer face where a mass had fallen away and the back was semi-rounded until it reached off to the right, in a smooth swayback sort of fashion as it leaned toward another high rock outcropping. I decided that I had to find a way to get to the top of that swayback ridge and look back upon this remarkable scene. I proceeded up the gorge. At times it was rough sledding over steep terrain covered with small boulders but I persevered and climbed up through a rock strewn slide to reach a high point from which I could back track horizontally toward the swayback and find my way to the top. This is not a place to twist an ankle. Huffing and puffing I made it to the top, sat down, drank some water and enjoyed the Rainbow Vista a magnificent place to be on a warm, clear day in Nevada. After a bit of a rest, feeling a great sense of accomplishment I back-tracked into the ravine from whence I had come. Down the slide over swirling pink, cream and red ridges strewn with tennis ball sized rocks to a point that was in the shade of my “Half-Dome” replica where I found a small opening in the wall, a little grotto perhaps a half meter deep, that provided cooling shade from the sun to eat my lunch. I was accompanied at lunch by a friendly nearby barrel cactus looking every bit like a thorny king penguin. I laughed at it and talked to it as if it might befriend me. Drank some water and ate some peanut butter crackers, then captured a video of its shape and thorny sides. Checking my bearings I started off again back up the opposing ledges, between boulders and creosote bushes, observing the little desert lizards as they scurried away upon my arrival in their territory. Soon I had found a new way up the opposite side of the canyon and topped the ridge overlooking my car in the parking area below I marched down the hill and off to the petroglyph trail. What a cathedral for an outdoor wedding! On the way, traveling up a steep rise I noticed a bluff off to my left that I was sure would offer a wonderful wide view of Rainbow Vista. Leaving my car at a pull out, I traversed up the hill through snags and bristles to a point where the majestic whole of it could be seen. 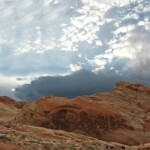 I could write all day and never explain what the panoramic photo below tells us about the Valley of Fire. The view from the bluff is breath taking. To the right of center are parked cars. Mouse’s Trap Trail is a fairly easy travail, roughly one mile round trip, through tall sandstone formations. On to Mouse’s Trap Trail the home of the petroglyphs. When I arrived in the parking area I observed a huge fancy motor home accompanied by a limousine parked to one side. A wedding was taking place in the canyon on the opposite side of the road. “Pretty spectacular cathedral for a wedding!” I thought. What was really remarkable was to be ambling among the petroglyphs in this historical canyon of mounds with skull-like patterns etched in them by erosion, the rocks pitted with holes of many sizes. Some had very large openings, where it seemed obvious that water must have carved such a shape. Large enough to see through and some one could quite readily crawl into, the stone floors inhabited only by small pebbles and sand—a safe place to sit out of the sun. Each petroglyph told a story or gave a direction, all had a purpose. This desert trail was home long ago, to distant peoples who made camp and told their stories around their campfires, built their huts (wikiups) and lived in a world almost exactly the way it is today except that we weren’t there. No cell phones. No autos. No highways. No visitor centers. No tourists who will soon return to comfortable hotel beds. This is the real thing, survival as our current civilization has hardly seen it. Artists and storytellers of those ancient times created images in the sandstone by incising, pecking, carving, and abrading symbols in the cliff walls to send prehistoric messages to those who might follow, that is us I suppose, this same trail thus contributing to the beginnings of history as we know it. Mentally retracing my steps through Mouse Trap Trail, foremost in my memory is the journey was too short. The ghosts lurking in the rock formations almost speak as you pass through begging to be discovered. People of times past certainly looked on this place as an oasis of shade in the midst of blistering desert sun. When did it cease to be a place and instead become a curiosity to visit. There is so much to see below the surface. My lasting impression is the height of the geological formations that surrounded the trail—the peculiar face-like formations—gave one an odd feeling of being observed by an audience. Though it sounds a bit like a movie script, I cannot deny, it was a bit unsettling, a psychological reaction. Plants grow in this habitat from incredibly difficult places. The passage weaved its way deep into the narrow canyons lined with eyelets of sandstone, incredible clinging plants, eroded holes and caves and tunnels through the soft rock. Hundreds of holes, large, small, odd shaped, some filled with small stones, some spewed forth desert vines of peculiar shape and composition reminiscent of scraggly hair. One could imagine young native lover’s finding a nesting place here to share the private moments of their love. The winding trail was lined with petroglyph rock art of exceptional simplicity. Symbolic themes repeated over and over by each succeeding generation. One could only hope that some poor Michelangelo-like native did not spend the most of his life building staging to reach the high points where the drawings appeared. The symbols for a shamen, or for rain, or for the sun are recurring themes scribed carefully in the darkest areas of the rock faces. Almost as if someone had swept through the canyon with a conte’ crayon casting a black coating upon the red rock that later became the background the natives would scratch away to reveal the under layer of red sandstone. Each symbol is a road sign, a notice or primitive historical marker. 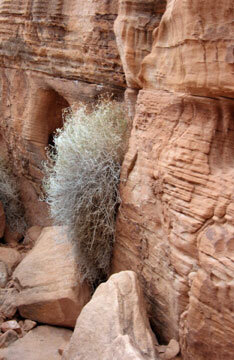 Clearly this narrow, deep gorge many times provided a haven from the sand and lightning storms so common in the desert. No doubt one could find safety here when alluding enemies as well. Signs of small animals were abundant, though I saw none. Small cliff caves the size of an oven, littered with boulders, provided shelter for new-born and for heat-struck travelers as well. At the far end of the gorge was a small spring-fed sink hole. Not drinkable by today’s standards but certainly a place to dip a kerchief and get relief from the dust and heat. I suppose the name “Mouse-Trap” refers to the illusion of a box canyon formed here by the gorge, though it appears one could climb out quite easily. “Climb out to what?” No doubt would be the next question. Retracing my steps toward the entrance I came upon a balanced pile of boulders sitting atop a pointed stone, leaning up against the canyon wall. Peculiar it is that we see the trail anew when walking it from the return direction. I suppose the heavy stone load was waiting for the pointed stone to grow tired and let the mass fall to the bottom of the gorge. That time could be very far off. Stones don’t tire very easily. Erosion might be a clue to what will happen next. Here is a shady spot, if you dare! The coarse sand beneath my feet allows tread marks cast by the bottoms of my shoes. Looking down I wonder if I tread upon the bones of ages, turned to dust, resting beneath my feet. “Ashes to ashes, dust to dust.” The Native American way included funeral pyres and offered great respectfor the treasured human virtue and wisdom that are the soul of a person. A soul set free from the body by fire to lend its wisdom to the earth, the sky and sea. 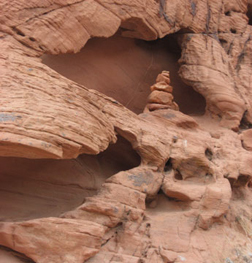 Totems are a common sight in the winding side canyons. Ancient Hindu teachings celebrate individual spirits as “a drop of rain falling from the sky”, a streamlet washing down to a puddle, then to a rushing stream, then a river and finally returning to the ocean from whence it evaporates to the sky to be reborn anew as rain drops from heaven. When our souls leave our bodies what remains returns to the earth to renew and give new life. Perhaps when we die our souls are reborn to a station befitting our behavior in this life. Are we each just a part of a cycle? I have great hope that individually we leave a greater legacy than that of a simple cog in the wheel. A legacy that ripples across the ages, rekindling the spirits of like-minded humans the world over. If you find yourself in the Las Vegas neighborhood, the Valley of Fire is a fine place to ponder one’s miniscule existence in the universe. There is much, much more to discover at the Valley of Fire I invite you to check the links of this blog for more specific detailed information. What a great post. This blog delivers!